Irish Americans proudly display their heritage in their last names. The Kelly’s, the Murphy’s, the O’Connor’s and the Byrne’s – such names bring to mind the clans of old, the heady days of warring kerns and heroic galloglaighs. But where did these names come from? What is the story behind the Irish surnames that so many Americans carry to this day? 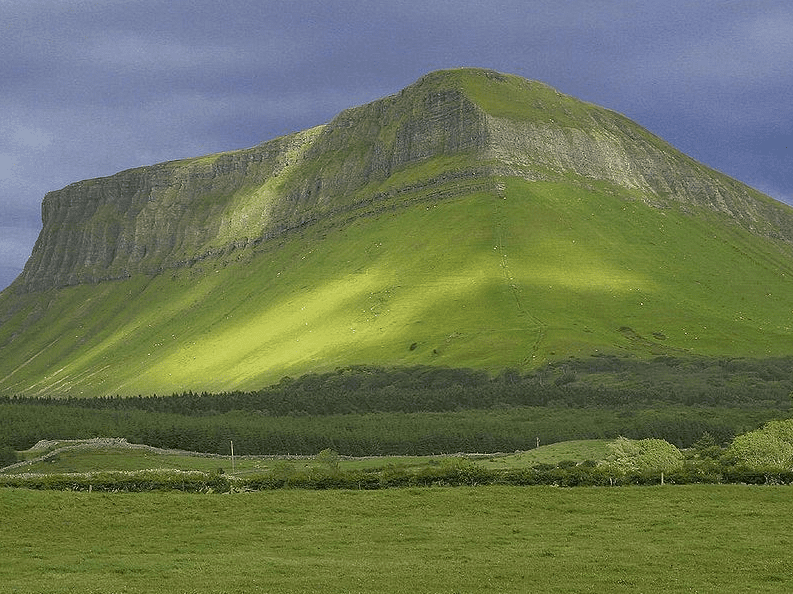 Photo: Ben Bulben, County Sligo, Ireland. Credit: Jon Sullivan; Wikimedia Commons. Before understanding Irish last names, it is essential to remember that first names have meanings all their own. For example, look at the Irish surname O’Brian. The O has a meaning that we will cover below, but what about the Brian part? Such commonly used names should not be taken for granted, because they provide a key to our ancestors. Somewhere down the O’Brian genealogy line was the original Brian, himself. No O. Just Brian. The same goes for the original Donnell of the MacDonnells and the first Allen of the McAllens. The descendants of Brian (meaning “noble”), of Donnell (meaning “world-mighty”), and Allen (meaning “handsome”) remember that somewhere down the line their ancestor earned or was given that name. In the old country, in the days of yore, a person was not so much defined by who they were but by where they came from, who their father was, or their trade. The uppermost heights that a son could gain were the same as those of his father or grandfather. The Mc in “McDonnell” and the Mac in “MacDonough” all mean “son of” in the native Gaelic, and all have survived and flourished as common prefixes to Irish surnames (though the original Mac is more common in Scotland). The feminine form, nic (meaning “daughter of”) is a rarity in modern Irish last names, which reflects the patriarchal society. Patrick, son of Brian, or Patrick mac Brian, was the given formula for how Irishmen would first describe themselves in the Middle Ages. In the meantime, Brian, the father of Patrick, would be known as Brian mac Connor, or the son of his own father, Connor. Mac – sometimes shortened to Mc – was said after the man’s given name and before the name of his father, denoting his male parentage. This method generally told enough of an Irishman’s story to identify him from others. Unlike in modern times, where surnames are very much essential to our identity in day-to-day life, the early Irish rarely needed to use them. The fact was, in an isolated, tribal society (known as “tuaths”) where everyone came from the same place and very little family history was recordable, it just made more sense to say who your father was rather than give your ancestral line. Thus, Patrick, Brian, and Connor would all have different surnames (surnames meaning: sired by) as each of their fathers would probably have a different given name (though names such as “Patrick mac Patrick” did occur, i.e., junior). Due to this generational change from one surname to another, it is difficult to trace Irish last names into the medieval period. However, like society itself, the tradition of Irish last names changed with the times. Feudalism, Catholicism, foreign invasions and intertribal wars brought pride in one’s lineage very much into vogue. Having an ancestor who was a landed lord, being the descendant of a saint, or someone in the line of ancient kings became incredibly important to the upper classes of medieval Irish society. The first Irishman with a recorded last name, Tigherneach Ua Cleirigh, was a lord who died in 916 C.E. in what is now modern-day Galway. The Ua denotes Tigherneach as being either the “son of,” “grandson of,” or “descendant of” Cleirigh (modern: Clery). The Ua would later become the O we are all familiar with in such names as O’Connell or O’Leary. This change to “grandson of” or “descendant of” is an important departure from simply saying “son of,” as it alters the narrative of a person’s name from “this is my dad” to “this is my family.” The most widely seen example of this comes from the name O’Brian, denoting a descendant of the legendary King Brian Boru… or giving a coincidental bit of luster to those with a different ancestor named Brian. It would be the feudal lords and barons that first took on the mantle of Irish surnames to denote their familial lineage, and no one brought the hammer of feudalism quite like the Normans. In 1169 C.E. they invaded Ireland in a stunning sequel to their invasion of England in 1066, bringing with them their particular blend of oppression and progress. To say it was a rough go for anyone under the Norman boot is an understatement, but it is also how Irish surnames gained the prefix Fitz, as in Fitzpatrick. This Latinized form of “son of” is still a popular prefix found in Irish last names. Not only that, but the Normans – and, more so, their English successors – altered the “son of” formula that had heretofore been the most common source of surnames in Ireland. “Smith” is an incredibly common name in the English-speaking world. But who was this Smith? What did he or she do that was so magnificent to have so many modern ancestors still proudly bearing their namesake? Well, in a word: they smithed. They were blacksmiths, locksmiths, gunsmiths, goldsmiths, etc. In medieval England what a person did, or what their family business was, often determined their last name. This is why there are still so many Archers, Cooks, Coopers, Masons, Thatchers, Fishers, Butlers, and Wrights in England and, since the English occupation, in Ireland. Such occupational surnames were fairly common in the early Irish lexicon, especially considering that specialized occupations were commonly passed down from parent to child. Irish surnames like O’Leary (from Ó Laoghaire, meaning calf-herder) or McLoughlin (from Mac Lochlainn, meaning Viking) tell the tale of sons who followed in the footsteps of their fathers. In fact, it wasn’t until the Normans and English established their feudal fiefdoms on the island and the markets and cities began to grow, that such names began to become invaluable. These last names immediately told a lord or merchant what you did and how you could help them. Think of them as business cards built into a name, an effective and subtle marketing tactic that a journeyman worker or skilled artisan would have been a fool to pass up. By the 1500s, traditional Irish Catholicism was put down in favor of English Protestantism and much of the native Irish population was resigned to second-class citizenship. This forced the Irish to Anglicize, to adapt and become more like their conquerors in order to survive these times. This is why so many Irish names have evolved beyond their Gaelic origins to fit more easily into the English language, some dropping the classic prefixes while others translated completely. Thus, Ó Ceallaigh became Kelly, Ó Murchadha became Murphy, while Mac Gabhann (the Irish occupational last name for a smith) became Smith. The traditional Gaelic names changed under English rule. Anglicization became a way of survival for many Irish people during the last five centuries and resulted in the Irish surnames we all know today. Below are some of the most common Irish last names not discussed above. Our family history research is often guided by our surnames. Find your Irish last name in the list below or use our surname meaning search to find your name and learn more about your Irish heritage. Byrne: meaning “raven,” the name is the seventh most popular in Ireland while the historic Byrne’s are notable for their resistance to foreign invaders. Kennedy: the Irish surname made famous by J.F.K., Bobby, and their new American Camelot, Kennedy means “helmeted-head” in Gaelic. Despite its modern connotations of political royalty, the name is one of the most common in Ireland. McCarthy: from Mac Carthaigh meaning “loving person,” the most widely known Carthaigh was a contemporary of the legendary king Brian Boru and one of his main rivals. Murphy: the most common Irish surname deriving from the Gaelic MacMurchadh, meaning “sea-battler,” Murphy’s around the world owe their name to the notorious Irish sailors who raided the British coast before the Viking Age. O’Connor: in Gaelic, Ó Conchobhair was a term that meant “patron of warriors.” The eponymous Conchobhair was the first king of Connaught, a county of Ireland that still bears his namesake. O’Reilly: from the original Ó Raghallaigh meaning “extroverted one.” The historic O’Reilly’s are one of the most storied families in Ireland, even minting their own coins in the 15th century leading to the still-in-use Irish slang term “Reilly” to denote high value. Ryan: combining the Gaelic words for little (an) and king (ri), Ryan simply means “little king.” Whether this was meant as a term of endearment or a good-natured insult is up for debate, though the name’s other translation, “illustrious,” would sway most to the former theory. Who we are and where we came from can help us find out where we’re going. Newspapers hold the key to helping you uncover new details about your Irish ancestors’ lives, their trials and tribulations, and your family history. Search our collection of Irish newspapers published in the U.S. to trace your Irish ancestry. I have always been in love with songs from not only Ireland but Scotland too! For years and years I had hoped to make a trip to both on our 25th anniversary. My husband being a full-blooded “Campbell” and my other relatives being Kennedy and Kelly. I love hearing the accents of all three! To just hear them speak is music to my ears! I am having trouble finding more information for both the Kennedy and Kelly lines beyond one generation. You’re very welcome, Wilma. Good luck finding those names! My great-grandfather John Elliott was from Calvin County, Ireland. When we went there we saw on a building a sign for “Elliott Builders.” We knocked but they were on vacation. I would love to get the phone number! I thoroughly enjoyed the very informative article about Irish names. Thanks for commenting, Sandra. We appreciate it, and are glad you enjoyed the article. Very interesting but I’m descended from Scots-Irish Presbyterians. Thanks for the correction, Paul; I have made the change. Thank you for this marvelous information. I have received information that some of my heritage comes from Ireland. This has been very interesting. I will look forward to the coming months. My name is Thomas Brengan, and my sons David and Jonathan have visited Northern Ireland with me. We visited the town of Armoy and found the Presbyterian church where my grandfather was baptized in the year 1861. We were able to view the register where baptisms, marriages, etc., were listed. We noted that the spelling of our last name appeared several ways for relatives we could identify. What of the Irish Catholic and Irish Protestant spelling of surnames, like Kelly and Kelley, etc? Thank you, so much. My Irish family are all deceased so I’m not able to discuss the past with them. Since my grandfather was a Smith from Ireland in the 1920’s, I find this very interesting. My mother’s second husband was a Walsh, whose parents came from Ireland. I know very little about my history. So, I really appreciate this information. I had read elsewhere that while names beginning with O were descendants of a family or tribe, that the chief of the tribe was denoted by the hyphen after the O. This meant ONeil was a descendant of the Naill tribe or family , while the O’Neils were direct decendants of the Tribal chief of the Naill tribe. That is what allegedly led to some names having the hyphen, while others do not. If you go back generations, you will see that families with the hyphen have and continue to use it and those that don’t do not. Do you have any info to support this definition or contradict it. I know that as an O’Donnell, that I am allegedly a descendant of the chief of the Domnaills family. Thus maternal cousins would not have been allowed to use the hyphen. Comment??? Note: I have relatives living in Ireland that seem to agree with this explanation. Was Ellis one of the Irish surnames? I would like to know more about the McCarty name. Early in the 1900s a C was dropped in our name. The work begins with an illuminating history of Irish names, followed by a great dictionary: 700 pages of Irish names in two arrangements, English-Irish and Irish-English. The English-Irish section contains 3,500 Christian names and surnames, each dealt with as a separate group. The Irish-English section, containing over 7,000 entries, gives the original form of the surname and its precise meaning, then its English equivalent and the former and present location in Ireland. Besides personal names, there is a section on Irish clan names, which are of great importance in tracing the early history of Irish families. This is so interesting and thank you for the information. My ancestors are McClutchie and McIlroy. What info do you have about them? Marseilles — You have several options in doing the search for Irish names. GenealogyBank.com offers a book “Irish Names and Surnames” by Patrick Woulfe. You can also search Google for help with the Irish names. Another site to look at would be Cyndislist.com. Both will give you options on looking for names in Ireland. You can also search FamilySearch.org, a free website that has Irish information. Very interesting; but, what about SHERIDAN? I know Richard Brinsley Sheridan was a literary person and Philip Sheridan was a somewhat famous Union Army general and Indian fighter. But, what does the name itself mean? Or where does it come from? Bill — Finding the meaning or origin of a name is difficult if you are not sure where the name originated. There are many excellent sites to be found with a Google search. Search “meaning or origin of surname.” It should give you some great ideas to find this sort of information. The book “Irish Last Names & Their Meanings” can be found on GenealogyBank.com. For more information about this book you can contact a representative from our site. I have read that my grandmother’s maiden mane was Irish. I had previously believed it was British. Are you able to clarify this for me? The name is Keiningham. I also enjoyed reading about the meaning of Irish surnames. I have visited Ireland twice and found it difficult to locate the surname “Gaffney.” I did locate Gaffney’s on the Aran Iles but otherwise it did not seem very common. Where can I find more information about my surname? Thank you for a very interesting article. I do have a question on the name Comer. I know the family came from Galway. We have been told that the name was originally O’Cairagain. However, I have met people with the name Comerford. Is that a variation of Comer or indicative of a completely different line? Thank you. Mary- There are some great books for Irish research on GenealogyBank.com. One of the books that may help you is “Irish Names and Surnames” by Patrick Woulfe. The work begins with an illuminating history of Irish names, followed by a great dictionary: 700 pages of Irish names in two arrangements, English-Irish and Irish-English. The English-Irish section contains 3,500 Christian names and surnames, each dealt with as a separate group. The Irish-English section, containing over 7,000 entries, gives the original form of the surname and its precise meaning, then its English equivalent and the former and present location in Ireland. Very interesting. My great grandmother was a McCarthy from Abbeyfeale, Limerick. My great grandfather was John Evans, born in Cornwall, Wales, who married Maria Price. His son, Thomas Powell Evans, migrated around 1885 to the U.S., specifically the Midwest (Chicago, Illinois) area. “strong in battle”, or it could be “all” (great), so that the name as a whole meant “great warrior”. Ancestry (https://www.ancestry.com/name-origin?surname=cahill) confirms that definition. They also give some possible surnames that might be similar, as names can and do change over time. House of Names provides some information on the Cahill clan, including a crest and coat of arms (see https://www.houseofnames.com/cahill-family-crest). Irish Surnames adds more details (http://www.irishsurnames.com/cgi-bin/gallery.pl?name=cahill&capname=Cahill&letter=c). John Grenham’s website specifies what Cahill means here (https://www.johngrenham.com/surnamescode/surnamehistory.php?surname=Cahill&search_type=full). He’ll also give you geographic locations in Ireland where the Cahills were oft to be found (https://www.johngrenham.com/findasurname.php?surname=Cahill). My last name is Dowell, not McDowell and not MacDowell. Am I Scotch-Irish or English? What am I? This is a tricky question you pose, as your surname appears in multiple locations throughout history [https://www.genealogy.com/forum/surnames/topics/dowell/1879/]. One train of thought is that the name Dowell is “Irish: reduced Anglicized form of Gaelic Mac Dubhghaill (see McDowell)” [https://www.ancestry.com/name-origin?surname=dowell]. What does that name mean, exactly? It breaks down to “black stranger/foreigner” [see https://www.surnamedb.com/Surname/Dowell%5D. This refers to Danish/Viking, dark-haired individuals. Another view [posed by John Grenham] says that the name stems from non-Gaelic originally, but also ties to Doyle, Dougall, and MacDougall –which appear to be merely variations of that original name [see https://www.johngrenham.com/surnamescode/surnamehistory.php?surname=Dowell&search_type=full%5D. For a list of well-known individuals with the surname Dowell, look here [https://en.wikipedia.org/wiki/Dowell_(surname)]. All that said, I’d recommend you chase the records and your own family stories that have been passed down. Start with what you know, and see if you can discover whether you be Scotch-Irish, English, some admixture of those, or none of the above. You might consider doing a DNA test to help you narrow down all those possibilities. Happy hunting!